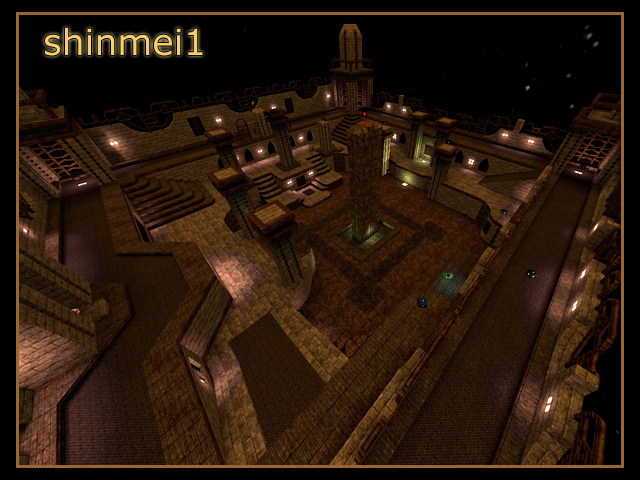 Small map made by me and shinki for 1on1 duels, instagib or ffa. Special thanks to soilah and Fatum for helping us on map testing. This map is my absolutly favorit! Perfect for useing zoom in long-range insta 1 on 1, as i love it. And the layout/texture speeks for it self! This map should work perfectly in instagib or ffa/duel. I like the layout, and the variations in geometry. Only thing that bothers me is the lighting, there are no shadows at all, looks almost like fullbright mode. Try to set /ambient and /skylight to lower settings, i.E. /ambient 10 and /skylight to something between 50-70 (while 70 is almost too bright again). Also i noticed some flaws regarding the clip material, there still are some spots where the clip material is either missing respectively where it is not on the same vertical level (corners in both cases). Other than that, nice work, and if i could make the decisions of which maps to get included, this would be a candidate for the next release for sure. Okay, I was gonna promote this content until I realised that the calclight detail is way low. You need to run "/calclight 3" so that it generates shadows and (decent quality) proper lighting. Apart from that, the map is well detailed and laid out. /calclight 3 is not needed here...you only need it to get alpha-masked shadows with mapmodels...here are no mapmodels. same with /calclight 2 - it is the same as /calclight 1, but gives shadows to mapmodels. Seeing that this map doesnt use mapmodels at all, /calclight 1 would be the perfect choice in this case. Also, /lighterror 8 and /lightprecision 32 (default settings) is enough. Updated using the svn version of Sauerbraten. Yeah, most maps shouldn't need to go below 32 really. I added this to Sauer SVN. While I was at it, I fixed some texturing errors I noticed on the edges/outsides of the map (nothing anyone would really notice, though).